Verizon announced on Thursday that its Windows Phone 8X will come equipped with wireless charging capabilities. This feature will be exclusive to the carrier is built directly into the device, according to a statement from the company. When placed on top of the charging pad, HTC’s Windows Phone 8X will automatically charge without requiring any additional cables or wires. This matches the wireless charging support included in Nokia’s Lumia 822, which is the Verizon variant of the AT&T exclusive flagship Windows Phone 8 device. The Windows Phone 8X will feature Qi wireless charging technology, reports The Verge, which means that it will be compatible with a variety of charging devices, docks and accessories. HTC officially unveiled its Windows Phone 8X in September, the same month Nokia and Microsoft revealed the Lumia 820 and 920 to the world. A hard release date has yet to be specified, but Windows Phone 8X will launch before Thanksgiving according to Verizon. Pre-orders for the handset begin on Friday at 1 am ET, along with the Lumia 822 pre-sales. Both phones will be available on two-year contracts. The Windows Phone 8X comes packed with 16GB of memory, a 4.3-inch screen made of Gorilla Glass 2, and an 8 mega-pixel rear-facing camera. But Verizon isn’t the only carrier rolling out its pre-orders this week. AT&T announced that it will also start allowing customers to order HTC’s Windows Phone 8X online beginning Friday. However, AT&T has offered a more specific launch window, saying that the 8X is scheduled to begin shipping next week. AT&T announced on Monday it will be the only carrier offering HTC’s smartphone in Limelight Yellow. 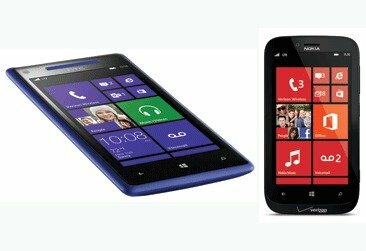 Verizon will be launching HTC’s Windows Phone 8 smartphone in three color variants: California Blue, which will also be available through AT&T, Graphite Black and Flame Red. Although the release date for both Verizon and AT&T has not been specified, it does seem likely that Windows Phone 8X will hit AT&T stores sooner. The carrier said the device would ship next week, while Verizon’s “before Thanksgiving” time frame hints that it could launch an entire week later. Verizon’s smartphone roster is expected to see some powerful additions by the end of the month, as it may also roll out Samsung’s Galaxy Note 2 before December rolls in. The Korea-based company’s “phablet” device may be seeing a Verizon debut nearly one month after its initial US launch, since it was released on T-Mobile’s network at the end of October.